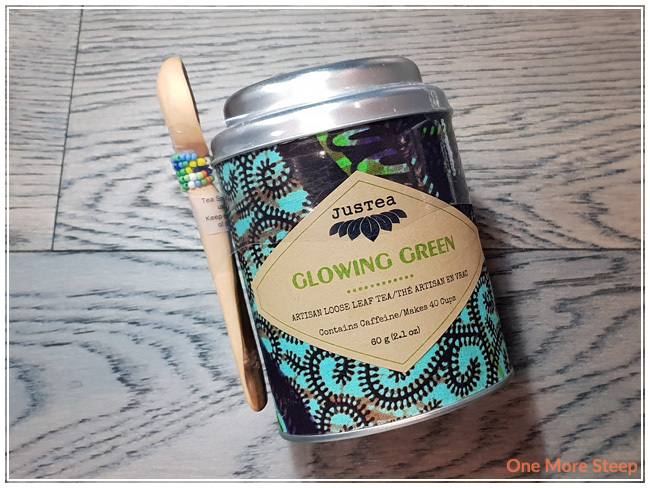 I picked up this tin of Glowing Green at a local retail shop shortly before the 2018 Vancouver Tea Festival and I was kicking myself because I could have gotten in there instead (along with so many pretties that JusTea had available). 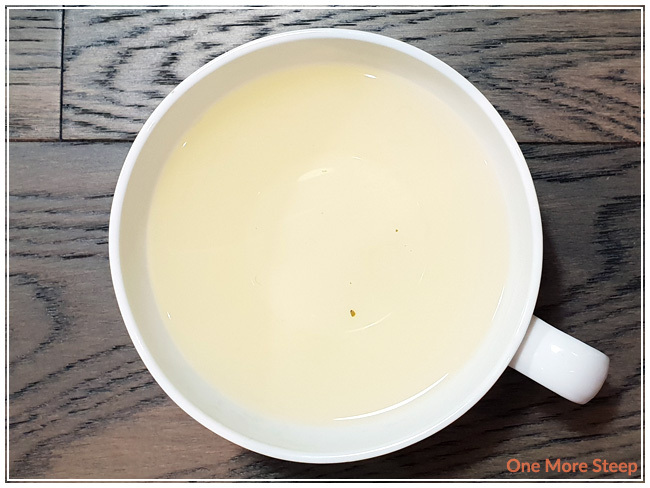 I’ve talked about JusTea before on One More Steep – they’re a tea company that partners with a tea farm in Kenya to create a fair trade tea product. Tea that comes in tin like the one shown below come with a hand carved, beaded wooden spoon. Glowing Green is a straight green tea, with tea grown from Kenya. The tins have pretty tight fitting lids, that feature a clear plastic window on top so you can see the tea inside. Each tin is hand-wrapped with Kenyan fabric, which I think is a really nice feature about this product. The tea leaves themselves are gorgeous and they look like they’d be pretty large once steeped. There’s an earthy aroma to it that reminds me of what it smells like after it rains, with vegetal notes that remind me of dark green, leafy vegetables. There weren’t any steeping instructions on the tin, but on the JusTea website they recommend steeping Glowing Green in 175°F (80°C) water for 3 minutes. I followed the steeping instructions. Glowing Green steeps to a pale yellow. There’s a lovely aroma to it, it reminds me a lot of grass/hay with a hint of cabbage. The flavour is the same as the aroma of the steeped tea. It’s really quite inviting, I find that there’s almost a floral sweetness to it this green tea which makes it pleasant to sip. I found it to be nicely balanced between the different flavours that I was able to find in my cup. I resteeped Glowing Green five times (six steeps total). I found that the tea was a darker yellow for the first two resteeps before getting lighter after that. 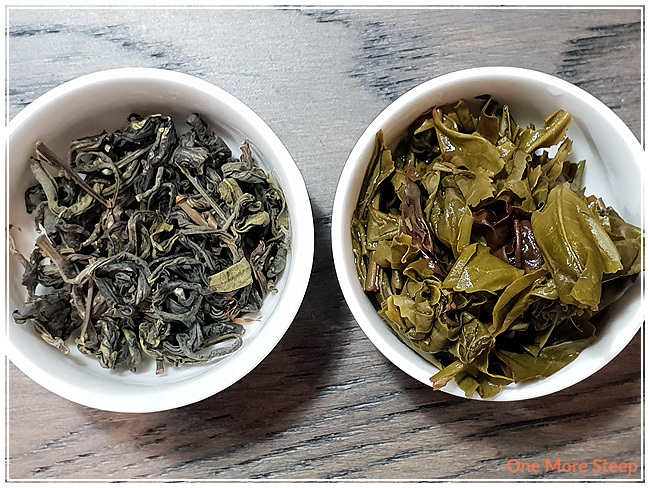 The flavour profile remained very similar to the initial steep, I found that the vegetal notes got stronger with the first two resteeps and then weren’t as prominent after that. I loved JusTea’s Glowing Green. 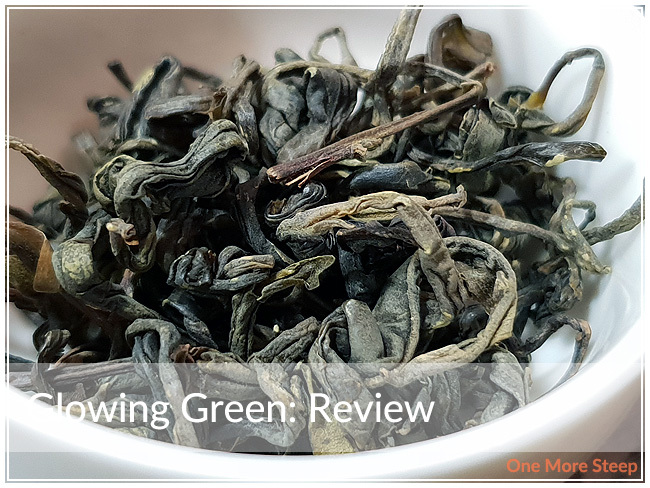 I really enjoyed the subtle flavours within this tea, I found that it was a really nice green tea with some great flavours that popped up throughout each sip – the grassy notes, the hay flavours, the bursts of vegetal notes were all nicely present and well-balanced. 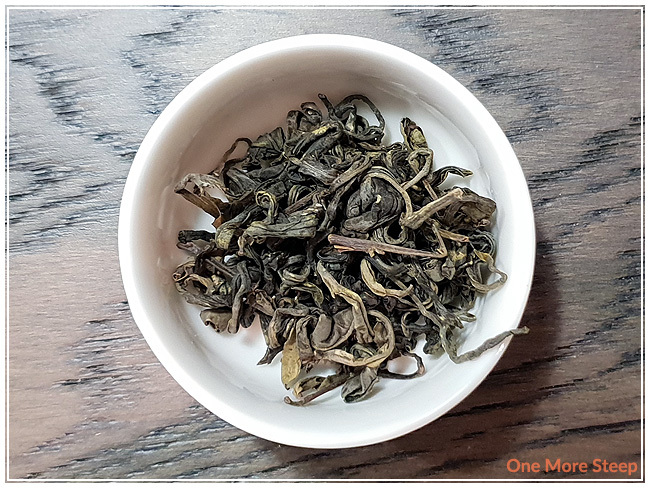 I liked the fact that this tea resteeped really well, which really shows me the quality in the tea leaves. And I really like knowing that the tea is fair trade, and that JusTea also works with artisans who hand carve spoons to help create economy on a local scale in Kenya. It’s always important to me, as a consumer, to know that people are being paid fairly for their work and efforts, and I love that JusTea shares on their website how they do that.